As an economic powerhouse, the opportunities presented by Southeast Asia are huge, but as both local and international companies seek to increase their regional IP creation, R&D and manufacturing activities, the disparities between local IP frameworks can create numerous pitfalls and challenges. It is against this background that IAM was pleased to return to Singapore for IPBC Southeast Asia 2018. Held at the Grand Hyatt Singapore on March 16, IPBC Southeast Asia 2018 built on the unprecedented success of the inaugural event in 2017, which brought together over 270 senior executives from IP owners such as leading regional corporates, research institutions and governmental agencies, plus emerging companies from across the industry spectrum. The programme took the core themes of IP value creation and corporate IP best practice and discussed them from the regional perspective, with particular attention to innovation-based growth and cross-jurisdictional IP management strategies. They focus solely on intellectual property as a business asset and how it can best be managed to extract maximum value. 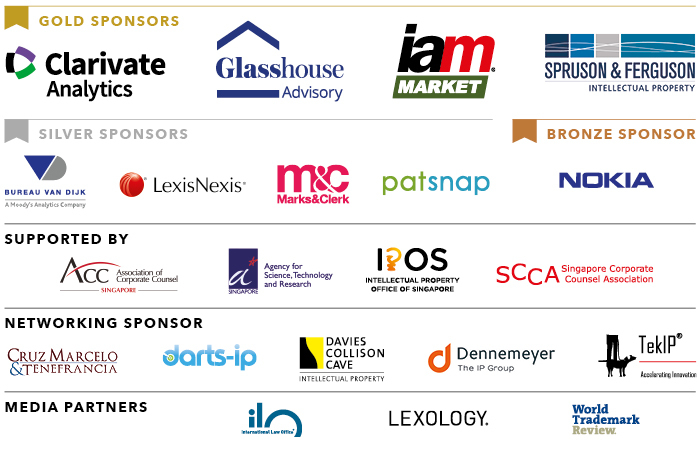 IAM is exceptionally placed to assemble an outstanding set of speakers and delegates – from both domestic and international markets – who bring experience, knowledge and insight to the issues that truly matter to senior IP decision makers. Limited delegate numbers, strictly enforced occupation quotas and carefully designed sessions mean that the events uniquely combine world-class IP business expertise with outstanding networking opportunities in an intimate and informal atmosphere. The IPBC format works because it brings together the most senior representatives from across the IP industry not just to discuss IP business, but also to do deals. For more information on IPBCs in Asia, including our multi-event rates and sponsor opportunities, please contact Kint Hui on +852 9169 1711 or at khui@GlobeBMG.com.